With fossil fuels running out fast it is now time to look at the more environmentally friendly renewable fuel sources available, one of these is wind energy. 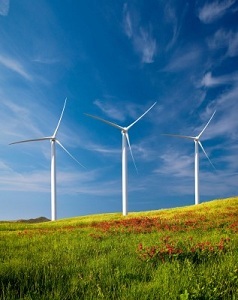 Wind energy is produced by turbines being operated by winds which can be as slow as 5mph. When the wind is blowing the blades are pushed around like a windmill and each circulation powers a turbine which then generates electricity. The UK has 40% of the wind energy in Europe making the country a prime target for wind energy generation both through wind farms and single wind turbines at homes throughout the country. Due to the initial easy setup, low maintenance requirements and high levels of energy produced, wind energy is one of the most cost effective renewable fuels available and is quickly becoming an attractive option for many! There are many myths floating around which give many a negative perception of wind energy. Most of these are untrue. Many believe that most of the time, due to low winds wind turbines are not working. In actual fact, wind turbines can operate in speeds as low as 5mph! The faster the wind the more energy the wind turbine will produce, if the wind is very strong the turbines will stop for safety reasons. One wind turbine, part of a wind farm can produce enough energy to supply 1000 homes over the year. There are many new wind farms popping up throughout the country, these are either on the coast or on mountains where wind is most prevalent. Home owners are now being encouraged to turn to wind energy in a bid to reduce the reliance on the National Grid and fossil fuels. If a home installs their own wind turbine, which could be on a roof or in a garden the home owner will then have their own source of energy production which can be used in their house completely free of charge! Any additional energy can be stored in batteries for future use or sold to the National Grid for profit! The government and energy companies are all investing heavily in energy production from renewable fuels and wind energy is one of these renewable fuels. The importance of moving towards producing your own energy can be seen through the many government grants and schemes on offer to help make installing your own wind turbines easy and affordable.